Bullet journaling has become a HUGE trend in the organizational and planning world recently, and for good reason. It’s an easy way to have everything in one place. You have your planner, your lists (or collections as they’re called), and a journal, all in one book. The original idea was meant to be super simplistic, just using a simple notebook and pen. I won’t go into detail about what a bullet journal is, but if you’d like more information, check out bulletjournal.com. Since Ryder Carroll came up with the idea, bullet journaling has taken off and gained a life of its own. While a lot of people still use the minimalistic approach, a simple search on Instagram or Pinterest will show that some people go all out on creativity. They utilize fancy fountain pens, water colors, expensive markers, not to mention the notebooks themselves that can get really pricey. Now, I love bullet journaling. I love being able to have the freedom to choose what pages to put into my planner and really customize each page to exactly what I need. That being said, I can’t afford spending hundreds of dollars on supplies for my bullet journal. And even if I could, I don’t think I could justify it! No matter what the product is I always try to find the best deal possible. 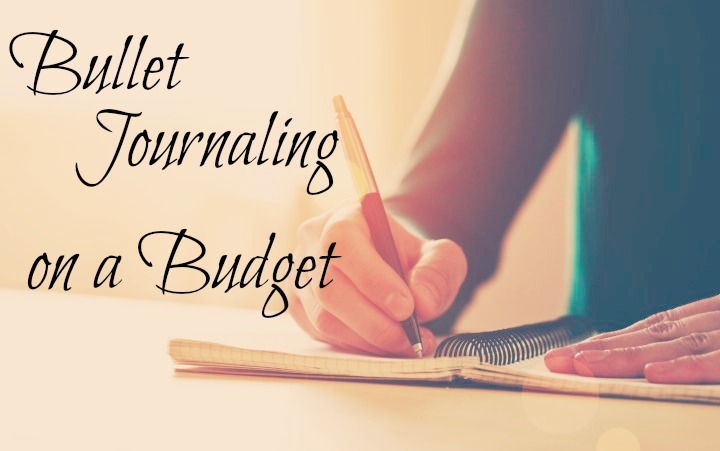 So for those of you starting out on the bullet journal adventure, but are wary of the costs involved, or for those of you just trying to find a great deal, here are some of my favorite items for bullet journaling on a budget. I use a basic sketch book when it comes to my bullet journal. Some people prefer the grid or dot grid pages, but for me, I prefer the cleanliness of the white pages. It makes it slightly more difficult, because I have to use a ruler for every line I want to draw, but in the end, I prefer the blank pages. I also like the spiral bound, so that I can fold the book over to the page I am working on and be able to leave it open to the day to be able to quickly look at it. The moleskins don’t provide that option. The sketch books provide a thicker weight page which means that my markers and pens don’t bleed through and doesn’t ghost. The only time I had an issue is when I was trying to use a fine point sharpie, there was a little ghosting onto the next page. Once I am finished in my current sketchbook, I am going to try a dot grid journal. Don’t knock it ’till you try it right? I found a dot grid notebook on Amazon that had the spiral bound, which ultimately is the most important thing for me. I will never not recommend the Pilot G-2 pen. I have loved this pen for years, used it all through college and in my work. They’re durable, easy to write with and and last quite a while. I usually use the .7 or the 1.0 for my daily pen. Ultimately though, your pen has to be something you like. Every person’s hand is different, and so you will find a pen that works for you and you’ll stick with it. These are the markers that I use and I love them. They are called Leisure Arts Double Ended Markers. I’ve attached the amazon link, but they also occasionally carry them at Walmart. They have a fine tip and a bolder tip. I haven’t had any issue with them drying out, and they have a great variety of colors. The only downside is that they aren’t marked or labeled, but I solved that by numbering them and then listing them on a page in my journal, so that I could be consistent in my colors if I needed to use the same color over again. While I have not personally used them, the Crayola super tip markers are highly recommended in the bullet journaling community, and are also fairly inexpensive. Washi Tape: Always be on the lookout for deals on Washi Tape. I love this stuff and it makes my pages stand out and give some color. But full price, they are not cheap! So I keep an eye on Michael’s ads for when they do sales, and Amazon does have some pretty good deals on them, however, I haven’t purchased any tape from Amazon, so I don’t know the quality of it. Colored Pencils: Some people prefer using colored pencils instead of markers, or in addition to. I’ve used them a little, and I don’t have a preferred brand, but Crayola usually has decent pencils. Post-It Notes: I use post it notes in my journal to mark future pages when I plan out my journal so I know I have enough room, and I use them on my meal planning pages. Usually I use the store brand, because they’re pretty much the same thing, but a lot cheaper! And that’s pretty much it! I also have a pencil and a ruler, and when I can find some good deals, I pick up some stickers, but it’s just something that adds a little detail since I’m lacking in artistic ability. Bullet journaling doesn’t have to be overwhelming or expensive. Don’t let the chaos and sometimes high price tags drive you away from creating your own bullet journal. The key is to make it work for you, not the other way around! Comment below and tell me what are your go to budget bujo supplies! Bullet journals make things so much easier! It’s amazing how organized someone can be with something like this! I love mine! Is that what it’s called? I have been doing a scaled down version for some time. Than ks for letting me know I can add markers and colored pencils. I love my journal. Since I started using it things are so much easier, and pretty too. i never really thought bullet journalling would be something i could do i just can’t draw and make it all pretty like everyone else. but i decided to keep it really basic, so i am using a notebook i got in some goody bag and i just keep it really simple – black ink, no pretty pictures. so far it is working well! Sometimes, that’s the best way to go! Looking at all the stuff on pinterest and instagram can be overwhelming! I’m such an avid journalist, but haven’t tried this style. Will have to check it out now! I love the simplicity of this post, your journal doesn’t have to be crazy expensive, just has to be you. Thanks for the reminder. Thank you so much for this! I’ve been wanting to start a bullet journal for a while now and one of my main “excuses” for not getting round to it was the cost involved! The thing about bullet journaling is, that you have what you want to have. So if you are not really into all doodles and colours, you can use an old notebook and just a random pen. That’s what I used for a couple of months, but after a while, I was influenced by a bullet journaling community and started organising my journal a little bit nicer, with colours and stuff. The beauty is that you can spend as little or as much as you want for the journaling. Thanks for the clear guide! I’ve never bullet journaled before, but, as a grad student in a writing program, I always need a journal and planner on hand! I love the idea of adding sticky notes – so simple but so effective! I ALWAYS used to use post it notes but was constantly forgetting things. This has been great to keep track of everything! Love this! I always struggle to find notepads with blank pages or faint lines – I never thought about buying a sketch book. I love how fun and colourful your pages are – time to revamp my bullet journal I think! Thank you! I love the freedom a sketchbook gives! Those Pilot pens are my family’s favorite too! We’ve been using them for years!